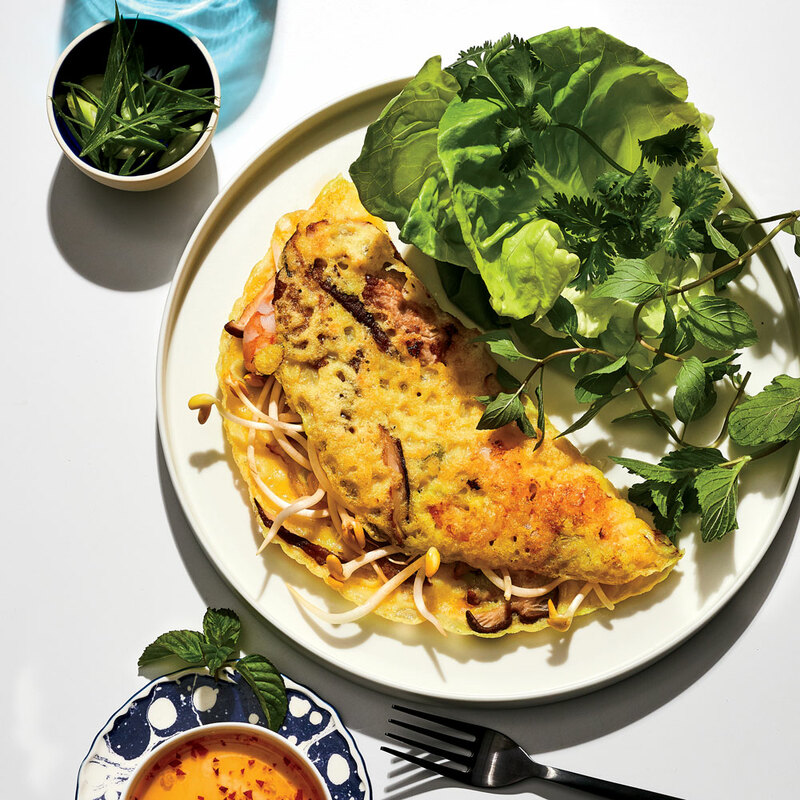 In 2018, Food & Wine named this recipe one of our 40 best: In 1989, Binh Duong, a Vietnamese refugee turned chef, owned one of the buzziest Vietnamese restaurants in America, Truc Orient Express in Hartford, Connecticut. Jacques Pépin was a fan. So was F&W’s associate test kitchen director Marcia Kiesel, who wrote that Duong’s dishes had “a balance that appeals to the shyest or most cosmopolitan palate.” Exhibit A: His bánh xèo, crisp and lacy rice crêpes colored with turmeric and studded with caramelized onions, shrimp, pork, and bean sprouts. The Vietnamese name of the dish translates to “sizzling cake”—so called for the sizzling sound the batter makes when it hits the pan. Preheat oven to 200°F. Heat 1 1/2 tablespoons oil in a 10-inch nonstick skillet over high. Add 3 pork slices, 3 shrimp, and a few mushroom and onion slices. Sprinkle with 1/8 teaspoon salt and 1/8 teaspoon pepper. Cook until pork and vegetables are lightly browned, about 30 seconds per side.